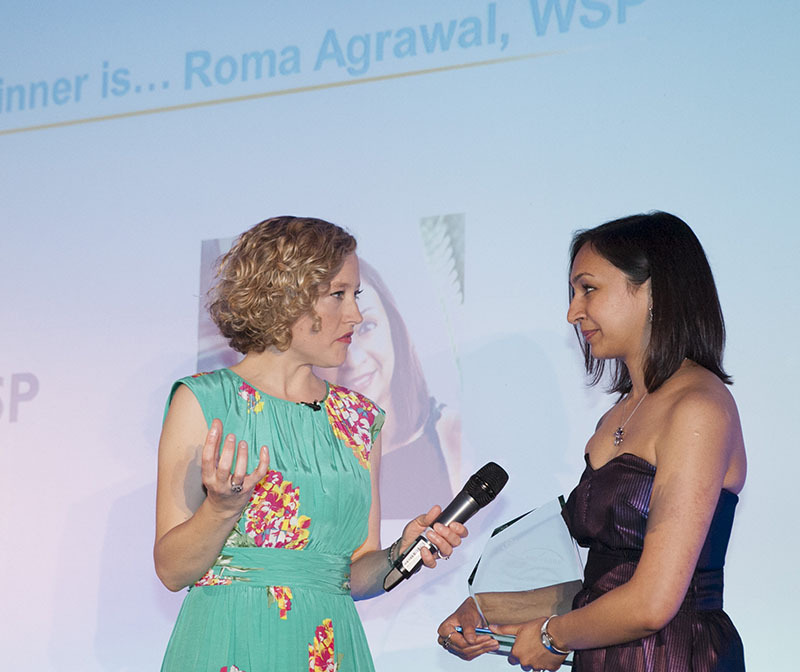 Awards wins help promote engineering says 2014 ACE Diamond Award winner Roma Agrawal of WSP. WSP structural engineer Roma Agrawal is just 30 but won the ACE Diamond Award of Engineering Excellence last week – the overall winner of all the awards presented on the night and given to someone making an outstanding contribution to the consultancy and engineering industry. She also picked up the highly competitive ACO Technologies sponsored Progress Network consultant of the future title. Awards night presenter Cathy Newman of Channel 4 news was equally impressed getting Agrawal a mention on the news programme and telling all her blog readers about the Diamond Award winner as well as the chronic lack of women in the profession. What is the value for engineers of entering awards? I find that entering awards helps you to meet many new people and creates new opportunities. I’ve received numerous requests to present to children and others about engineering through these contacts which is a great help for my mission to spread the word about our profession! How did that mission come about? Being a young woman and working on project like the Shard gave me profile and people started to ask me to things. I decided to say yes to the opportunities rather than no. Standing up and being noticed is not a natural thing for me but I am encouraged to continue because I see the difference it makes in terms of awareness of my profession. The opportunities come to me because I am a young woman from a minority – I realise I tick a lot of boxes - but people come back to me because I say something interesting. Would you encourage others – women and men – to do more to raise awareness of their profession by being more visible in schools, the media, government initiatives and on line via blogging etc? Yes, engineers need to stick their heads above the parapet. The public need to know what we do because there is a huge shortage of people with our skills and we need to encourage more people into the profession. It is good to be a role model so parents can see people succeeding in engineering. In terms of spreading the word about the engineering profession what would you like to do next? What has the reaction been like at WSP to your wins and outside WSP? Everyone at WSP is always very supportive and this time is no different. I work on exciting projects here with great engineers and am always learning. The reaction outside WSP has also been very positive; it was really exciting to be mentioned on Channel 4 news by Cathy Newman. Devolving power to local regions brings huge opportunity – but are we ready?